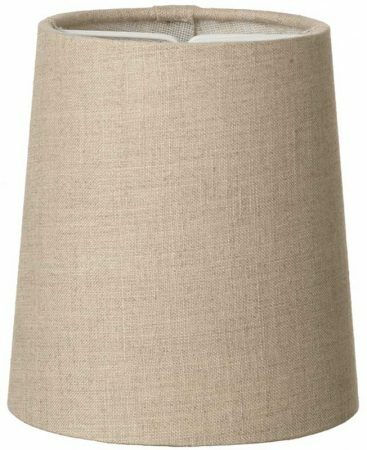 The Byron tall natural linen clip-on candle lamp shade is designed to fit chandeliers and wall lights fitted with candle lamps. A slim and slender lamp shade that clips directly to the light bulb, hand made in Britain from unbleached natural linen. Freshen up a tired wall light or chandelier and get maximum impact for minimal outlay. Hand crafted to order, please allow 7 – 10 working days for delivery. Hi could you please send me the top and bottom diameter dimensions please.I am looking for a clip on light shade with a bottom diameter of 10cm, top diameter of 8 cm and a height of 10cm. The dimensions of this clip on shade are 9cm diameter at the top, 11cm diameter at the bottom and the height is 12cm.